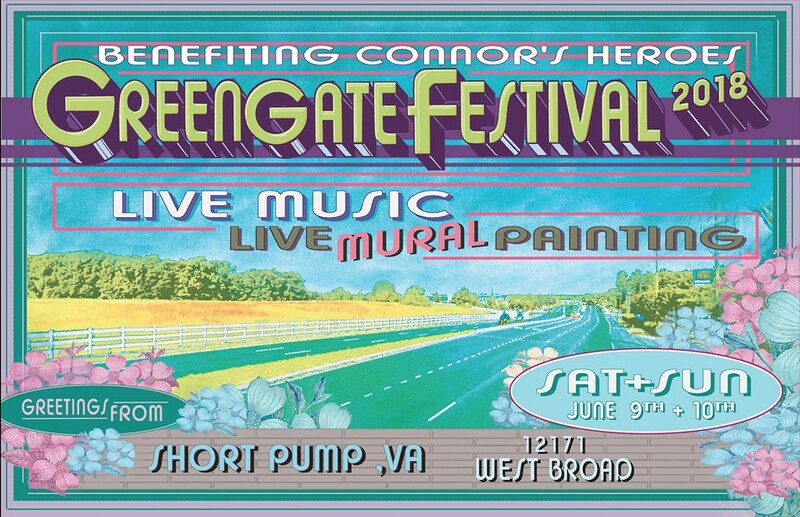 GreenGate Festival 2018 | Happenings | Style Weekly - Richmond, VA local news, arts, and events. Come kick off the summer by joining us for this year’s GreenGate Festival 2018, Saturday June 9th from 11am-6p and Sunday June 10th from 12p-5p! Watch live mural paintings by local artists, listen to live music from local Richmond bands and enjoy delicious food and beer trucks. We will also have a dedicated “Kid’s Zone” filled with fun entertainment including art projects, face painting and balloon artists. CycleBar will also be providing a unique sidewalk experience including an outdoor cycle class. All proceeds from this event will go to benefit Connor's Heroes, a local Richmond charitable organization.